Virgina is for Gay Lovers | Equality for All in Virginia! Equality for All in Virginia! Gov. 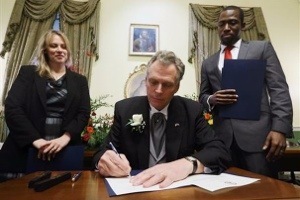 McAuliffe signs Executive Order No. 1 prohibiting discrimination based on sexual orientation, gender identity..
Virginia Gov. Bob McDonnell has unveiled plans to incorporate our state slogan into the standard-issued Virginia license plate. 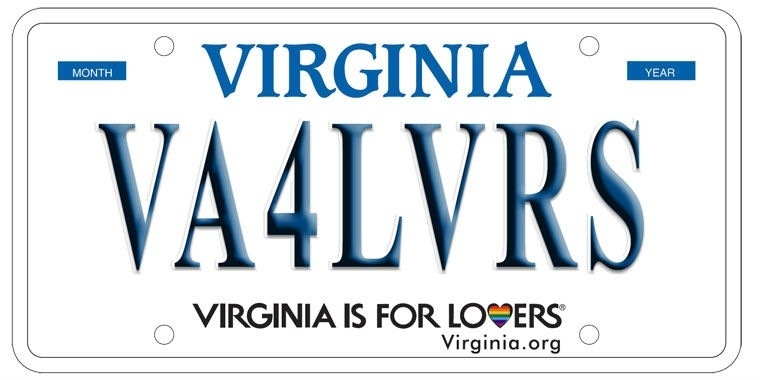 All standard plates will say “Virginia is for Lovers” at the bottom beginning on March 1. Maybe someday the plates will include the gaybow heart..I added that for now. Equality Virginia is working on a brilliant campaign right now to get Equality license plates on the road throughout the Commonwealth and beyond! Virginia has the coolest thing going, we put these LOVE signs all over the state because that’s how committed we are to truly making a difference. We want to share the love, spread the love, feel the love..we love everyone and everything here and it’s beautiful. Here are some locations for finding these wonderful signs in the LOVELY state of Virginia. * Wolf Creek Indian Village, Bland Co. Please send me pics of you and the LOVE signs that you have visited here in Virginia. Welcome to Virginia! It’s for Lovers! Welcome to Virginia where we LOVE our fellow man, woman, child..whatever. Gay, straight, brown, black, white, male, female…whatever you are, Virginia is the place for you. “Virginia is for Lovers” isn’t just a state slogan, it’s a way of life. If you aren’t living in Virginia yet, get here and let us share our LOVE with you!